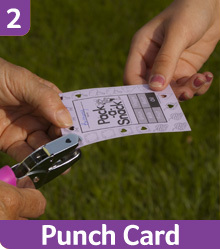 Pack-a-Snack® is an incentive-based program that helps young people discover and enjoy healthy snacks. Based on the U.S. Government Department of Agriculture's MyPlate® (part of an initiative based on 2010 Dietary Guidelines for Americans to help citizens make better food choices), Pack-a-Snack builds on MyPlate and encourages young people to select and eat healthy snack foods. These are snack foods which add essential nutrients, provide healthy choices and proper portions that will help enhance children's learning opportunities and behavior. Why emphasize snacking? Young people eat almost 30% of their calories in snacks. Helping youth make healthy choices for 30% of their calories goes a long way towards improving their nutritional well-being. And that is no piece of cake! The "secret ingredient" in Pack-a-Snack is the Incredible Edibles Snacks™ list. This list provides over 125 common, easy-to-find, healthy snack foods that young people enjoy. There are no recipes to make, no special ingredients to buy, just simple foods to enjoy. Using the Incredible Edibles Snacks list as a guide, your people are able to select and be rewarded for choosing Incredible Edible Snacks. Step-by-Step/Recording Sheet - Implement Pack-a-Snack in six simple steps and keep track of the nutritional awards. Incredible Edible Snacks Explanation - Check out the pertinent information regarding the 125+ Incredible Edible Snacks. Parent Take Home Tips - Help parents learn about Pack-a-Snack and the Incredible Edibles Snacks list. Food Allergy Sheet and Poster - Make participants aware of any food allergies within the group. Snack Cards (25) - Mark a Snack Card when Incredible Edible Snacks are brought. 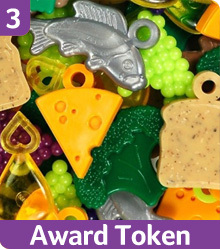 Nutritional Awards (150) - Award the unique tokens that correspond to the MyPlate® food groups. Incredible Edibles Snacks Poster - Educate and answer questions using this fun colorful poster. Wise Size Snacking Poster - Learn how to avoid portion distortion. 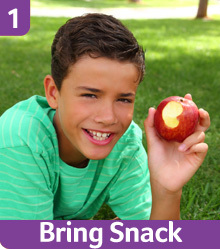 MyPlate® Good Eating Cards - Aid young people in recognizing healthy snacks with a handy reference card. All public schools are federally mandated to develop and implement policies to address the health and wellness of their students. pack-a-Snack is an easy, integral part of this important process.